Bush rock has been in use since the arrival of the early European settlers who used it to build homes, enclosures, walls and even memorials. Nowadays, we still use bush rock, but less out of necessity than for its beauty – it’s more commonly found in landscaping than in construction. We also show much more respect in sourcing this wonderful stone, while preserving the bush life that exists around it. Bush rock is usually used in a garden to add a natural feel, especially in combination with native plants, around water or in rockeries. By its nature, bush rock is random in shape, size and colour, and this variety is part of its natural beauty. Large feature pieces of bush rock may be so big and heavy that machinery is needed to move it into place. These rocks are ideal as the central feature of a native garden, or as the basis of a waterfall. 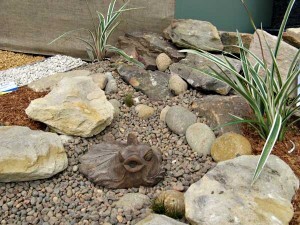 Smaller pieces can be used to build walls, rockeries or water features, or as garden edging. However beautiful you find bush rock, you can’t simply just park at the side of the road and walk into the bush to get some. Many native animals, from spiders to snakes, make their home in bush rock, or use it to hide from predators, severe weather and bushfires. Others source their food in its cracks and crevices. Bush rock also provides a habitat for plants, mosses and lichens. All forms of rock take centuries to develop. Even rocks lying loose on the ground may matter to hundreds of plants and animals. Careless removal may endanger their lives – and result in a bite to you from whatever poisonous animal might be using it as a home. If you need any more of a deterrent, remember that lifting or moving bush rock in a national park or conservation area is illegal and can result in a fine. Actually removing bush rock, or damaging it, may result in a five-figure fine or even jail time. So, if you want to use bush rock, you must first find a responsible supplier who sources bush rock when it becomes legally available, for example, as a result of quarrying or when land is developed for farming or construction. It may take time to become available, but there are always alternatives such as quarried sandstone. Do you have bush rock in your garden? Admittedly, a man-sized bush rock would be hard to miss in your own back yard, but there may be other treasures that don’t look like gold until you look a little more closely. Those unwanted rocks and stones at the back of your flowerbeds might combine with others to create a little rock feature or miniature without costing you a cent or harming any bush life. Respect the age of the product you are working with – if it is safe to do so, lay bush rock without using concrete or mortar so that it can be reused in the future, by you or by somebody else – or even by a new generation of Australian flora and fauna.